Sanya received 241,600 tourists during the 7-day National Day holiday, an increase of 5.09% over last year, according to statistics issued by the city’s statistics bureau and tourism bureau. 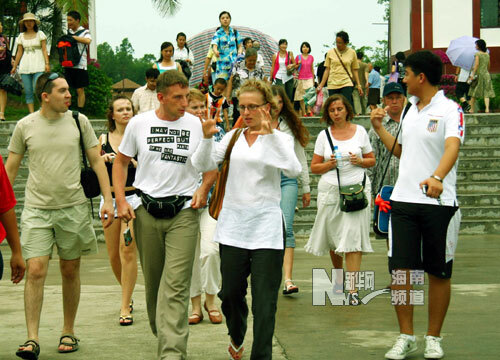 The city’s tourism revenue also jumped to 799 million yuan, 27.71% over the same period last year. Affected by Typhoon Naset and Neglae, the average occupancy rate of hotel rooms in the city reached 63.36%, a drop of 4.19% given the 10% increase in the total number of hotel rooms. During the Golden Week, the number of tourists visiting the Yalong Bay Tropical Rainforest Park jumped 100.98% year on year to 42,800, while other resorts such as Nanshan Cultural Tourism Zone, Tianyahaijiao, and Wuzhizhou Islet received 68,900, 81,400 and 11,900 visitors, representing a year-on-year decline of 8.1%, 7.84% and 26.52% respectively.